With the summer ebbing away, my family were in need of a short holiday, but we had grown so tired of no–care airlines that even the prospect of the Aircoach was beginning to make it more like a chore than a well-earned break. There must be some other way to spend quality family time without the queues, we thought. What's more, I was determined to show my family, comprising of my wife Lisa and children Isabel (15) and Thomas (13), that Ireland could offer much more than the usual format of the so-called 'city break'. I suggested some local options. "How about a River Shannon cruise?" It was a question that, quite honestly, did get a mixed reaction at the kitchen table. But with an open mind and a sense of adventure it was something they all thought (eventually) would be worthwhile giving a shot. The navigable River Shannon runs for 400km but if you've got just three days, where does a novice start? It might be the essence of leisurely cruising to drift along, going where the river might take you, but that could not be this weekend's plan. In order to satisfy my teenage crew, I felt this had to be exactly the opposite: a 72–hour whistle stop tour packing in as much fun as we could along the way. But could a 20km stretch in North Roscommon really measure up to a weekend in London, for example? The county is landlocked, yet there are plenty of lakes to make up for the lack of any coastline. Loughs Key, Allen and Ree are all situated in the county. But more than that, one of the more notable features of Roscommon is the fact it is the home of well-known actor Chris O'Dowd, who grew up in Boyle. He's also a family favourite, as it happens. Experience had taught me it's the simple things that mean the most, so I was sure that if I spent a little time in planning it could go a long way. I decided there were some basic requirements for a successful trip that would provide fun for the family and some nice memories. First of all, we'd want our weekend to have minimum travel time to the destination. There should be activities for my family to do together, and the chance to learn something new. There should also be easy access to dining options. They say cooking on board is a Shannon cruise pleasure but we decided against it – it's meant to be a holiday, after all. And I knew well that if we ended up stranded on the river bank looking at one bag of crisps, with a long walk at dusk to the nearest town, then it would be a short–lived cruise at that. Carrickcraft is a leading Irish Shannon cruise hire firm that has a base in Carrick-on-Shannon in Co Leitrim. 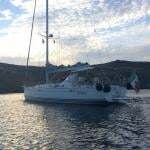 I booked a three-day cruise with a start and finish in Carrick, on board a self-drive Kilkenny Class (4 + 2 Berth) for three nights priced at €765. On the map, Carrick looked like a central enough location, and not too remote. But early research into what we might do when on the water wasn't easy. Certainly, there were guides but not much in terms of joined-up thinking for waterborne tourists. There were navigation charts. There were route planners. There were restaurant guides. There were activity guides. But what I needed was the nice easy spoonful of an entire travel plan that tied in journey times with berthage, activities with restaurants. For instance, I spotted that some of the nicest sounding restaurants in Georgina Campbell's invaluable Inland Waterways Restaurant Guide were not always accessible by boat. I just coudn't work out how we could get to a restaurant at dusk and back in the dead of night. Taxis in this neck of the woods can be as rare as river kingfishers. And dark country roads are not pedestrian-friendly. To make a success of our short break, I had to join the dots between time, food and river, so I ended up making up my own itinerary – an idiot's guide, if you will, to cruising on the River Shannon: the 72–hour edition! My research time was well spent, though, because within an hour or so I had sketched out a voyage that might involve wildlife, history, literary links, Hollywood stars, gourmet food, navigational tips and exercises, bike trails, high-wire tree-top adventures, castles and islands. But most of all, we would be captains of our own ship of adventure as we steamed up and down the River Shannon, in search of 'The Moone Boy Burger'. Did we expect to find such weekend adventure and welcomes, just an hour-and-a-half from home? No, we certainly didn't. 12 noon – It's half-day Friday! Collected kids from school and headed straight for the N4. From Dun Laoghaire it's two hours (169.2 km) via the M4 and N4 to Carrick-on-Shannon. First sight of our weekend home, Carrickcaft's Kilkenny class E22 cruiser. Journey time has been so instant the kids are still in school uniform! 2.30pm – Before we set sail, it's straight to restaurant #1: lunch at the Oarsman! 4.30pm – We get an instructional tour of our Kilkenny Class cruiser and a helpful driving test from our Carrickcraft guide, Padraig. And there's a bit to know: If you're reversing, steer left if you want to go right. Gottit? 5pm – We depart Carrick-on-Shannon and head downstream under the bridge to Jamestown, because restaurant #2 has been booked for at least a fortnight. 6pm – 'Watch out for the strong flow on the river at the end of the navigation.' Whoa, they're not joking! No room at the inn at Jamestown Quay thanks to a couple of what looks like long term harbour hoggers but we find a spot round the corner and berth up for the night on the nearby Jamestown Canal at Ardanaffrin Bridge. Glad of the company of one other cruiser, it feels lovely but a tad isolated. 6.30pm – It's anicent Ireland time as we pass through the town gates. No wonder Roscommon marketeers use the phrase 'the beating heart of Ireland's past' to describe the place. 6.40pm – We're at the Arch Bar for pre-dinner pool and pints. With starters served in cigar boxes, Chef Sham and manager Lee Hanifa pull out all the stops in a restaurant that uses only locally sourced produce. What a first night treat! 10.30pm – Taxi! No Uber or Hailo here. It turns out to be a bit of a wait for Jamestown's only cabbie, CK (Tel: 086 0772020). It's a €7 fare well spent, though, as we avoid walking on some pitch-black switch back roads (no paths, no street lights). A great night comes to end – CK Taxi is well worth the fare... if you can get him. 8am – Good morning! After some early morning reconnaisance on foot, we like the idea of a short detour to explore Jamestown Canal. 8.40am – It's like stepping back in time. Solitude. 8.50am Immersed in this Victorian feat of engineering, it's left to Thomas to ask: "Dad, how are we gonna turn around?" 8.55am We manage a six–point turn. The E22 is pretty manoeuvrable. Phew! And in the process, we catch the unmistakable glimpse of a kingfisher flying alongside us. 9am – Turning back on ourselves, we head upriver on our journey to Lough Key Forest Park. 9.15am – This shower will pass! The heavens open and we're glad we've got umbrellas on the flybridge. Is there any finer way to enjoy a rasher sandwich than with a nice cup of tea sauntering down the Shannon, master of your own ship? 9.30am – Breakfast as we cruise: rasher sandwiches and a hot cup of tea served on deck. Can you beat it? 10am – Pitstop at Carrick to, ahem, check the car's locked! 10.30am – There's a knack to this navigation thing, but it's a game for all the family as we plot our course upriver. We remember to keep the red buoys to our left and the green on our right upstream. Downstream it's the opposite, green on left and red on right. 11am – Into Lough Eidin. This beautiful lake hit the headlines in 2000 when President Mary McAleese applied for planning persmission to build a lakeside house, outbuildings and a jetty here. We can see why, it's a tranquil place...just don’t scour the books looking for it by that name because it's more locally known as 'Drumharlow Lake' and it's a top fishing spot. 11.20am – Into the Boyle River. 11.40am – Cootehall. What an enchanting bend in the river that invites further exploration of John McGahern's hometown, but the quay has already got boats on it. Another jetty is in a state of collapse. Sadly, we sail on. 12 noon – We pass Knockvicar and Tara Marina and continue on the winding Boyle river. 12.30pm – Clarendon Lock, with its picturesque weir, is a very pretty Shannon setting. 12.35pm – Call from Seamus in Bike Trails: "Are ye still coming?" "See ya in 40 minutes, Seamus." 12.50pm – We spot The Moorings restaurant and a handy adjacent marina. Could this be a lakeside dining detour tonight? 1pm – Making our way across the lough, we pass several small islands, then it's a 90 degree left for our overnight berth. It's like we've sailed into a scene from Lord of the Rings with forests, islands, castles and turrets on every headland! 1.10pm – Mooring at Lough Key Forest Park Marina. 1.45pm – We saddle up with Seamus and we're on our way on an 8km bike trail. 3pm – What a ride! Tummies rumbling, we're ready for a snack at the Woodland Cafe. 4pm – Time for an afternoon nap on board for some, a spot of fishing for others. And is there time for Zipit? Certainly. 6.45pm – We take the Ranger Service for the 3km shuttle into Boyle. We're the only passengers. Efforts are being made to connect local moorings at Lough Key and the Boyle Marina with the town. A 15–minute run into town on the Ranger Shuttle costs just €1 per head. Our driver gave us a guided tour too! 6.55pm – Our bus driver points out Chris O'Dowd's family home. We're closing in on Moone Boy now! 7pm – We arrive in Boyle and pick up supplies at Londis on the hill. Oops, forgot the carrier bag! But the shop owner offers to drive us back to the boat. It's typical of the warm welcome here. 7.05pm – We head to Clarke's Bar and Restaurant in search of the 'Moone Boy Burger'. 9.45pm – Waiting for the return shuttlebus at King House. 10pm – We arrive back at Lough Key Marina. Still the only passengers. 10.05pm – Back on board E22. Why can't we get this heating to work? 10.06pm – Brrr! Night, night! 8am – A spot of early morning fishin'? 9am – Feeding the ducks as we wait for the onsite cafe to open. 10am – Breakfast toasties in hand, we're heading for downstream for home. 10.05am – Across Lough Key in autumn sunshine. 11.40am – Back in Cootehall – and now there's a free quayside berth! Take it! On a bend in the Boyle River, yet another picturesque spot appeared in front of us – except when we went ashore, we found it deserted. 12.10pm – Back aboard cruiser E22. 12.2pm – Enter Lough Eldin. A pair of swans take flight and fly alongside us for seemingly ages. Even enough time to grab the camera. It edges out yesterday's kingfisher as the wildlife highlight of the trip. 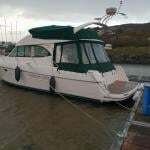 13.30pm – Return to Carrick-on-Shannon Marina, leaving E22 as we found her. Thanks for the memories, E22! Writing in the Sunday Times recently, columnist India Knight described how a friend holidayed just 40 minutes from where she lived. She concluded that the things we love doing are often familiar – and close to home. This Shannon trip proved this was also the case for us. From kingfisher spotting to tree-top advenure, this was an intrpeid voyage by our standards. We never expected to find such good times along the river, and we thoroughly enjoyed our three days afloat. When a yacht is one hundred years old, it might be normal to celebrate the event, perhaps by breaking open a bottle of champagne with a few close friends, or having a small celebratory article printed in ‘Afloat.ie’, or even head off on a remarkable cruise, to celebrate such a long survival. However, the Shannon one-design class, designed by Francis Charles Morgan-Giles (1883-1964) built their preview boat in 1921 (which no longer survives), and trials were offered to sailors on the Shannon River, in order to promote the idea of a one-design for the Shannon. Everybody who sailed the new boat were impressed, and during the winter and spring of 1922, nine boats were built to the new design, seven of which were built by Walter Levinge of Creaghduff, Athlone, Co. Westmeath. Numbering started at No. 32, so these new boats were Nos. 33, 34, 35, 36, 37, 38 and 40. In 2017, the surviving boats, Nos. 32, 33, 37 and 40, celebrated their 95th birthday, so, it was decided to have a pre-regatta, in preparation for a bumper centenary regatta in 2022. It was the owners of No. 37, ‘Kiwi’, Peter and Owen Delany and their siblings, who put together the idea of the pre-centenary regatta to be held at Lough Ree Yacht Club (Est. 1770) over the weekend of 29-30 July. A notice was circulated to the owners of the other 95 year olds, and to all the newer Shannon one-design owners (most recent boat in No. 179), and 15 boats turned up to race and to party. On Saturday, the wind was 12-25 knots which resulted in one compulsory reef. Race one went to the opportunistic Alan and DJ Algeo in No. 138. Then, after lunch, race two was won by Andrew Mannion in No. 97, who also managed to win race three. This was followed by a Pimms party, and dinner for eighty celebrants in the Lough Ree clubhouse. On Sunday, the rain belted down, but the wind was lighter, so the reef was no longer mandatory. Racing north of the Yellow Islands, saw Miss Georgina Corbett in No. 108 win race four, and race five was won by veteran sailor Frank Browne in No. 86. The final race after lunch was held in the flukey waters close to the clubhouse, and was won by Harmon Murtagh Snr and Jnr. as popular winners. However, there were no discards in the six race series, which resulted in Miss. Corbett being declared the overall winner by one point from Dr. Mark McCormack on No. 50 which was built in 1925. For full results see below, and all SOD sailors are welcome back in 2022. #MCIB - The dangers of boating while under the influence have been highlighted in the official report into an incident on the Shannon near Limerick city earlier this year. One man died and three others were hospitalised after their boat capsized north-east of Limerick city in the early hours of Thursday 4 February, as previously reported on Afloat.ie. The official report into the incident by the Marine Casualty Investigation Board (MCIB) has found that the four men, none of whom had any boating experience, were under the influence of alcohol and/or drugs when they took the boat from Castleconnell Boat Club shortly before 4am. The small aluminium boat had its drain plug removed, as is standard when storing such boats ashore, and quickly began taking on water as the four men paddled to an area known as the Gap of the Dam, where the river narrows, and into a torrent fed by heavy rainfall in the previous fortnight. Losing control of the boat as they guided it to trees on a spit of land in the river, it grounded on submerged rocks and capsized, throwing all four men into the water. None were wearing lifejackets. One man caught his leg under the capsized boat, another was swept away while attempting to lift the boat off his friend, and a third became entangled in undergrowth after losing his footing, while the fourth managed to contact emergency services with his mobile phone after several attempts. Gardaí and teams from the Limerick Fire Service and Killaloe Coast Guard arrived between 4:35am and 4:45am but faced great difficulty mounting a rescue attempt due to the fast-flowing water and low light conditions, though all four were recovered by 7am. Two firemen were commended by the MCIB for their courage in staying in the water for over two hours to assist the man trapped in undergrowth, though he was unresponsive when finally recovered from the water and later pronounced dead due to drowning at Limerick University Hospital. Impaired judgement due to drugs and/or drink taken over a number of hours was cited as the main factor in the tragedy by the MCIB, explaining the men’s recklessness in taking out a boat in darkness with no experience and lacking safety gear. The board recommends the issue of a Marine Notice reminding the public of the dangers of operating any water craft under the influence. The full report from the MCIB is available to download below. #Kayaking - A trio of intrepid kayakers have reached Carrick-on-Shannon this afternoon (Thursday 16 June) on the second day of their long-distance charity paddle along length of the Shannon from Lough Erne to Killaloe. Ger Harrington, Peter Brewitt and James Lynch hope to complete the 220km challenge by this Sunday 19 June in aid of the Irish Motor Neurone Disease Association, as the Clare Herald reports. All three are experienced on the water, Harrington and Brewitt being longtime kayakers and Lynch being the first person to swim in the length of Lough Derg two years ago. The team are posting regular updates on their journey on their Facebook page while raising funds for the charity that helped Harrington's late mother in her final months in 2012. #PlaneSailing - The Boeing 767 that wowed Ireland as it sailed by barge from the Shannon Estuary to a Sligo coastal town arrived at its new home, according to RTÉ News. Preparations were being made last night (Saturday 7 May) to move the aircraft fuselage from its barge to the nearby site of Enniscrone entrepreneur David McGowan's ambitious Quirky Nights Glamping Village – where it will be converted into unique accommodation alongside converted buses, boats and black cabs. As previously reported on Afloat.ie, the aircraft set sail from Shannon on Thursday on the barge after being lifted from the airport grounds earlier in the week using a specially commissioned cradle. Today FM's Anton Savage Show, which has regaled listeners with McGowan's 'plane sailing' adventures over recent weeks, even broadcast from Enniscrone hours before the Boeing's arrival to mark the event. #PlaneSailing - Video has emerged of the Boeing 767 being sailed by barge from the Shannon Estuary up the coast to Enniscrone for its new life as part of a 'glamping' site in the Co Sligo seaside town. Local funeral director and entrepreneur David McGowan has kept listeners to Today FM's Anton Savage Show updated on his plans to make the decommissioned plane – nicknamed 'The Big Yoke' – the centrepiece of his Quirky Nights Glamping Village concept. As previously reported on Afloat.ie, McGowan hopes for the aircraft to arrive in Enniscrone by tomorrow (Saturday 7 May). And what's more, The Anton Savage Show will broadcast live on location from 11am on Today FM to celebrate its arrival - follow the hashtag #PlaneSailing on Twitter for live updates. Said Savage of the incredible story: “First we thought David was funny. Then we thought he was crazy. Now we’re sure he’s a genius. #PlaneSailing - A funeral director's ambitious plans for a unique 'glamping' site in Enniscrone will move a step closer to fruition later this week as he prepares to sail a passenger jet by barge up the coast from Shannon. That's right, a passenger jet – a Boeing 767 to be precise, which David McGowan picked up for a song from a liquidating Russian airline, as the Irish Examiner reports. McGowan is the entrepreneur behind the planned 'Quirky Nights Glamping Village' in his Co Sligo seaside town, where the former airliner will be the centrepiece of a development that will also feature repurposed train carriages, dry-docked boats London black cabs. All will be refitted to accommodate a new kind of camper inspired by boutique festivals like Electric Picnic, people seeking the beauty of the outdoors and the comforts of hotels with a twist. But getting the plane from Shannon Airport to Enniscrone posed a problem, as it's simply too big to transport by traditional means. Hence the need for a barge to sail it by sea along the Wild Atlantic Way, and a specially engineered 'cradle' to lift it onto the barge. That didn't come cheap – more than double what McGowan paid for the aircraft itself – but it did the job, and the plane is now ready at Knockbeg Point waiting for the weather to clear before the barge sets off this Thursday, expected in Enniscrone on Saturday 7 May. A previous version of this article incorrectly attributed Independent.ie as the source of quotes from The Anton Savage Show on Today FM. #Shannon - A local man is in critical condition after the boat he was in capsized on the River Shannon in Castleconnell outside Limerick city early this morning (Thursday 4 February), as RTÉ News reports. The man was one of four who were in the water for more than two hours clinging to their upturned vessel as rescuers struggled to reach them due to a fallen tree in the river. #Flooding - Moves to prevent flooding in the Shannon catchment may be in breach of EU habitats directives, as The Irish Times reports. Next Tuesday (5 January) the Taoiseach is expected convene a meeting of all relevant State agencies to discuss flood measures along the River Shannon. And according to Simon Harris, Minister of State for the OPW, some suggestions – such as dredging and flood barriers – "will breach the EU directives" as they pose a threat to fish and birdlife. The Shannon and its catchment are home to a number of protected species from salmon to kingfishers. But Minister Harris said flood prevention measures were a necessity when the river catchment faces "a humanitarian crisis in some areas" due to flooding that began with Storm Desmond nearly a month ago. It's a situation that will only deteriorate over time, with Met Éireann indicating that climate models predict worsening winter floods further into this century.